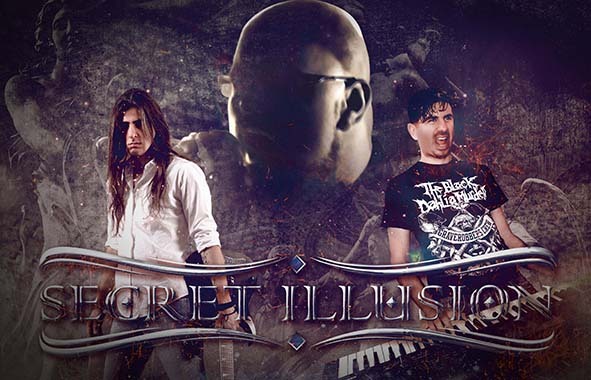 Filippos Papakyriakou of Secret Illusion discusses their new album Awake Before the Dawn with Andy Carey of Prog Pulse. Please tell me a little bit about your new album ”Awake Before the Dawn"
“Awake before the Dawn” is a melodic power metal album with some prog elements, containing tracks expanding from fast/dynamic metal to more emotional mid/slow paced songs. We, as a band, love the 90’s power metal sound and feeling, so the fans of the genre will probably find it interesting enough. If we could try to find the right words to describe this album and our music in general, it would be probably melancholic, emotional, melodic, wandering. We love power metal, we make music that makes us (and hopefully others) feel good and thoughtful and we also want to keep the flame of this genre alive. I know this is a hard question but anyway :-) If you were forced to say that your album is for fans of "X" - which band would that be? It’s not a hard answer for us though. It’s definitely Stratovarius (the old stuff 1987-2007). It’s a band we admire but I guess over the years and especially with our last album, we have managed to create our own sound. But I believe always there will be an “old Strato-flavor” inside the music of Secret Illusion. We do not (and we never wanted) to copy this band…just though our way of composing music, what we do is, I guess, to keep this special music spirit burning. Make fun, feel creative and energetic. When we started the pre-recordings for the album, we realized that there are so many good ideas on the table, so we decided to do our very best to present the best possible result and I believe we’ve achieved that. “Curtain Falls” is a short symphonic/waltz intro. “Neverland” is probably the most melodic and easy to remember song of the album. “Fall of Human Kind” is a fast/explosive and keyboards driven power metal track. “Sailing the Open Sea” is a mid-tempo track, also a very melodic one and at the same time very emotional. “Hope is Lost” is a typical fast euro-power metal song with really cool melodic vocal lines and fast solos. “Kings and Pawns” is the most heavy and aggressive track of the album. “Winds of Tomorrow” is again a melodic mid-tempo track…great guitar and keyboard parts here and nice solos. “Falling” is the ballad of the album, great piano parts and melancholic guitars along with the expressive voice of Vasilis Axiotis. “Eerie” is the most…eerie and unique track of the album, being fast, slow, power and prog at the same time, changing attitude every passing minute. 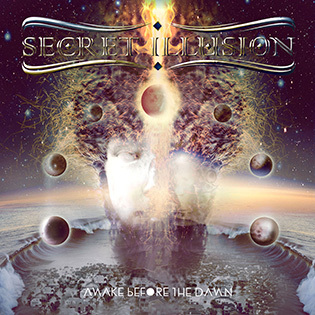 “Awake Before the Dawn” is the biggest track of the album, almost 10 minutes, and besides being powerful, symphonic and emotional as a song, is probably one of the best Secret Illusion’s songs since the beginning. All the songs were tracked in DeadStar Studios and subsequently mixed and mastered at NRQ studios in Ukraine by Nikolas Roy Quemtri. We used logic pro x as our main daw. Korg Kronos together with sound libraries from Omnisphere were used to record keyboards. Italian traditional accordion of the brand Giustozzi was used for the accordion part in the song "Awake Before the Dawn". Guitars and Bass were recorded via passive Radial DI boxes and then reamped using Makarov Krank Custom head and Mesa standard slant cab. Lead Guitars recorded with V-amp and POD amplifiers. Drums recorded at DeadStar Studios using Tama drum kit. Vocals were recorded on an AKG C414 XLS condenser microphone. The recording and mixing/mastering process took about 1½ year. It was a long process, there were some small setbacks along the way but the final result was great and it was worth all the effort. In what way do you think your album is different from your last one? Well, “Awake Before the Dawn” is a multidimensional album compared to the previous one. “Change of Time” has really great compositions but is a more typical euro-power metal album. “Awake…” contains a variety of musical influences, huge symphonic arrangements at some points and very tight structure. Of course, all the power metal elements are still there, as always. How important do you think your lyrics are compared to the music? For us, music and lyrics are equally important. There cannot be a complete composition without significant lyrics to support the music or the opposite. A good thing about Secret Illusion is that after you listen to a song a couple of times without reading the lyrics, you will understand, after doing it, that there were a lot more to learn and experience about the song and it’s meanings. Making good music and doing the things we love and make us feel happy, I guess. A tour abroad, it’s not in the band’s plans for now, for many reasons. We have though some thoughts about a unique special live show here in Athens, since it is a decade from our first release, back in 2008. We would also like to participate in European festivals in order to play live in front of our fans. For now, we will focus on promoting “Awake…” all over the world and it’s going quiet well actually so far. Very soon we will be able to start the recordings for the next album, since we have already 4-5 new songs composed and pre-recorded. Hopefully the next album will be ready very soon and it will be released within the next 2 years. After that, who knows…fate will decide! You know, we were very disappointed to see our songs or our whole album on YouTube or download torrents the first day of the release. All our efforts for the last 3 years, were uploaded for free, just like that, in a second. This is something though that every (underground at least) musician of our generation must endure and live with that. This is how the things work nowadays. But apart from that, there are still people who want to support the bands and especially the new ones, there are still people who buy music and cd’s but really no one can tell if this will last for long.